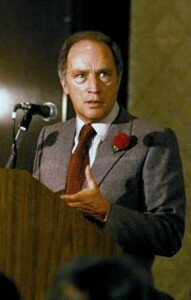 Pierre Elliot Trudeau, fundraising meeting at the Queen Elizabeth Hotel in Montréal, Québec, 1980. Recently many economists have emphasized that since the 1970s in western nations like Canada and the United States, high profits and productivity have been accompanied by stagnating wages, especially for lower income workers. These commentators, including Nobel Laureate Paul Krugman, MIT professors Erik Brynjolfsson and Andrew McAfee, The New York Times’ Steven Greenhouse, and UNIFOR economist Jim Stanford, have argued that in the 1970s, wages became decoupled from profits and productivity, ending a pattern of complementary increases existing since the end of the Second World War. But still, major politicians, including U.S. Presidential Candidate Jeb Bush, say Americans need to work harder before better wages materialize. People can only bring inflation down by lowering their expectations…because if we all adjust our incomes downward, then inflation will come down. But if we all think inflation is going up, then we all tend to adjust our incomes upwards and inflation will go up. With the above statement, and dozens like it, Trudeau stressed that Canadians needed to fight inflation by adjusting their mindsets. To let the status quo prevail was to enable a destructive “we want it all and we want it now…state of mind that can only lead to disaster.” For Trudeau, these unreasonable expectations were rooted in a postwar world where everything was deemed possible. In contrast, Trudeau longed for the “conventional wisdoms” of the past—that wealth and progress must come from capitalist ingenuity and profit, not increased social spending and labour militancy. There would be “no more goodies,” Trudeau declared, because austerity had “to be instilled in the psychology of the people.” Along this line, Trudeau would argue that inflationary expectations were symptomatic of anti-social behaviour driven by selfish economic institutions, key among them “the big unions” who were “trying to get a big slice of the cake and pass on the results of their greed to the little people,” by which Trudeau meant the burden of rising costs of living. But did unions and the working class cause inflation, and the social pathologies that coincided with it? One telling piece of evidence indicating the negative was leaked from within Trudeau’s government. This document, from just before Trudeau initiated his last round of anti-inflationary measures (the 6&5 Program) was frank: such programs were not about inflation, but wage depression. The piece would note for instance, that Trudeau’s first round of wage and price controls from 1975 to 1978 (the Anti-Inflation Board) did little to actually control prices, but was formidable at lowering wages. The purpose of the 1982 6&5 Program—which only affected workers in the federal public sector—was to prevent them from catching up on all these years of lost real incomes since the 1975 controls came in. More directly, the report admitted that the very same federal public servants being controlled had lost the most money in real terms since 1975. By keeping their wages down, it would empower private and provincial sector employers to do the same, resulting in a general decrease of wages that bolstered corporate profitability and competitiveness. Laws of a similar nature were passed in many provinces, and companies cited Trudeau’s guidelines when they bargained with their staff. As the report would note, “high federal [wage] settlements, even though justified…would provide a demonstration effect on private sector wage trends.” The result was that many unionized workers were, by law, prohibited from freely bargaining for increases above 6%–well below contemporary inflation rates. The political motive was clear: whether it was true or not, the average voter blamed unions and not capitalists, for inflation. Even though federal workers had wages rising slower than inflation in the 1975-1982 period, the government realized, based on polling, that “there is a desire to see some measure of punishment of the civil service…a feeling that it is some sort of elite group…that has insulated itself from the hard economic realities of the day.” As it is for Jeb Bush today, the image was more potent than they reality. But was the story this simple? How relatable is it to today’s great decoupling, along with its implicit justification by Jeb Bush and others? In strict terms, there are too many factors, both national and international in scope, to sift through when examining the longitudinal relationships of wages, prices, profits, and productivity. But it’s clear that Trudeau’s intent was to use policy and public pedagogy to convince and coerce workers into taking less pay to demonstrate their patriotism for a Canada in crisis. But this patriotism was not to be equally borne. While the pursuit of profit was still lauded by Trudeau, to seek better collective agreements was, in Trudeau minister Bryce Mackasey’s words, trade unionists “fighting the ordinary citizen…fighting the nation to which he owes allegiance.” Greed was still good, but only if the greed came from the right social class. The average worker hasn’t had a real wage increase in more than two decades. It began with the wage and price controls imposed by Trudeau’s government, which hit workers, but no one else. If you were a professional or a corporation, there were ways around them. Since then, except for a few groups…there have been no real wage increases. Is there a solution to any of this? These trends are driven by global forces, which makes political solutions in a single nation less effective than in a pre-globalized economy. But if Trudeau, Bush, and others have been successful over the past forty plus years at weakening unions and convincing workers they deserve to be poorer, the solution to closing the gap between profits and wages comes through a few veins. This includes stronger unions, laws that make forming unions easier, and a counterweight to the long-running public pedagogy that workers deserve their poverty, that capitalists deserve their wealth, and that harder work, even without mechanisms for economic democratization and redistribution, makes us all richer. Christo Aivalis holds a Doctorate in History from Queen’s University, where he teaches Canadian labour, political, and social history. His SSHRC-funded dissertation examined Pierre Elliott Trudeau’s relationship with organized labour and the CCF-NDP from 1945-2000. His work has been published in sources including the Canadian Historical Review, Labour/le Travail, Our Times Magazine, and Rankandfile.ca. (All fonds from Library and Archives Canada) PET Fonds, 013, Vol. 17, “Transcript of the Interview of the Prime Minister to Margaret Leahy and Larry Day,” 18 June 1982. PET Fonds, 07, Vol. 578, file 280219, Trudeau to A. Porteous, 15 November 1976; PET Fonds, 013, Vol. 12, file 21, “The Prime Minister’s Interview with Fraser Kelly and Peter Thomson,” 18 April 1968; PET Fonds, 013, Vol. 33, file 4, “Text of the Prime Minister’s Address,” 13 October 1975; PET Fonds, 013, Vol. 12, file 37, “Transcript of the Prime Minister’s Remarks,” 2 November 1969. CCF-NDP Fonds, 1993-0407, Vol. 50, “Discussion Paper on Anti-Inflation Policy Options,” 9 January 1981. For this 1975 Mackasey speech, see PET Fonds, 020, Vol. 28, file 15. Christo, this was fantastic. Thanks for posting. From the point of view of a federal public servant whose biggest wage increase was 6% followed by 5% and haven’t seen a COL increase in over 35 years …right on.